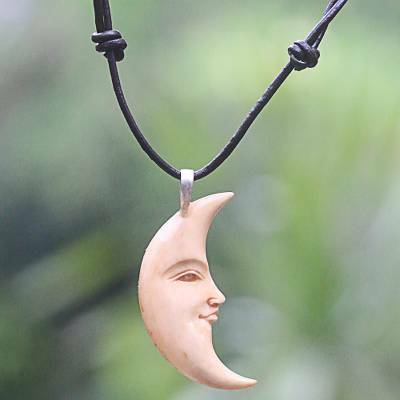 Hand Carved Balinese Moon Necklace in Leather and Bone, "Serene Crescent Moon"
The crescent moon smiles mysteriously as it drifts in the unseen heavens. Realistically carved by hand, the bone pendant graces a necklace by Made Wardika. He colors the carving by bathing it in tea and displays it on a cord of dark brown leather. this moon necklace is so well made- always get compliments. Love this necklace! Very high quality and also love the adjustable leather cord. This is a beautiful piece. The moon is very well made. The necklace is adjustable and is nice and long. It’s really a quality piece and it’s peaceful! I would recommend it to anyone that is considering buying it. You won’t be disappointed. It’s fine quality. The detail and hard work that was put into this wonderful piece of art is very obvious. I wear it everyday, even in the shower and it still looks in perfect condition. Thank you so much for this wonderful and beautiful piece of jewelry! I got this one for me! I usually use Novica as my special gift giving central because everything is so wonderful, but, I adore the moon so this one became mine. It's gorgeous! Delicatey carved, light weight.I get so many compliments when I wear it.